Lease payments calculated based off of a 39 month lease with 10,000 miles per year, $2,500 is due at signing. $0 security deposit required, with approved credit. Extra charges may apply at lease termination. Plus, title, tax, lic. and state fees with approved credit through INFINITI Financial Services. See dealer for complete details. Expires 4/30/2019. Vin#KA010771. MSRP $35,995. 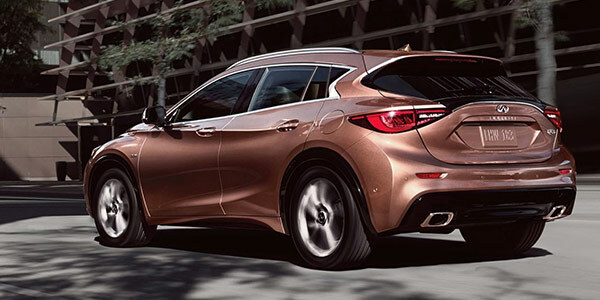 The 2019 INFINITI QX30 is truly the best of the practicality and performance worlds. The QX30 offers the efficiency of a hatchback and the active handling of a crossover. In the looks department, the QX30 offers concept-car styling with a nicely crafted interior. New for the 2019 edition are a Navigation Package that allows owners to sync their vehicle to their smartphone and a 19-inch Gun Metallic Wheel Package. You’ll have a hard time deciding if the 2019 INFINITI QX30 is a luxury crossover that handles like a sports SUV or if it’s a sports SUV that’s also luxurious. Either way, you’ll have loads of fun driving it. The QX30’s throttle response at low revolutions make city driving a joy. Furthermore, the Dual Clutch Transmission renders shift delays a thing of the past. This spectacular transmission uses one clutch for even-numbered gears and another for odd-numbered gears. That way, the next gear is pre-selected; thus making for a smooth shifting you’ll hardly notice. The specialized suspension improves handling while absorbing bumps in the road giving you the smoothest of rides. 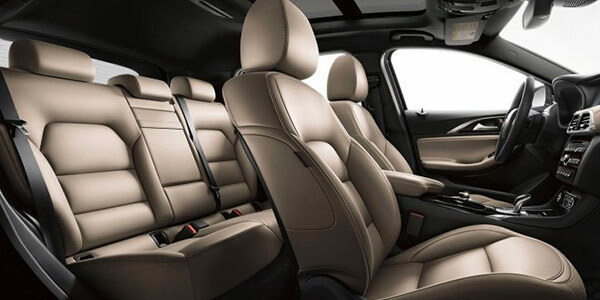 The QX30 cabin is distinct and full of rich premium materials. It looks – and feels – upscale. 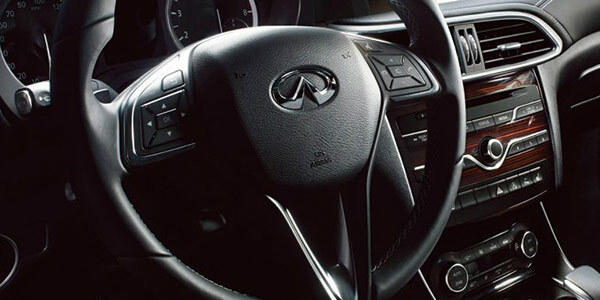 From the leather-wrapped steering wheel to the leatherette touches on the dash and central console, the QX30 will pamper driver and passengers alike. The INFINITI InTouch™ connectivity system won’t allow occupants to miss their connection to the outside world. Furthermore, with advanced voice-recognition technology, the driver doesn’t get distracted or have the need to take his, or her, hands off the steering wheel. The optional 10-speaker Bose® premium audio system will transform your QX30 into a mobile sound studio. Also, the available InTouch™ services will make navigation a snap. Not only can you send your destination to your car, you can also search effortlessly for points of interest along your route. Your adventure awaits and the 2019 INFINITI QX30 is your ticket to it. Protecting you, the passengers and your vehicle, the 2019 INFINITI QX30’s safety features include an Around View Monitor that gives the driver 360 degrees of perspective. This highly advanced safety technology uses 4 cameras to build a virtual 360º bird’s-eye view on your display. The Moving Object Detection alerts will let you know if there are objects or people moving within its perimeter. You’ll drive with confidence knowing that Active Driving Assistant, Intelligent Park Assist, Lane Departure Warning, Blind-Spot Monitoring, Forward Emergency Braking and more are there to ensure the safest ride. Embrace the versatile compact crossover. 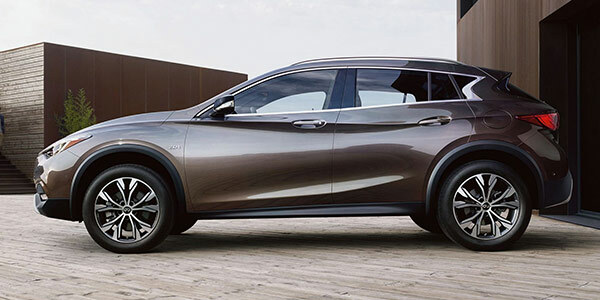 Schedule your 2019 INFINITI QX30 test drive at Zeigler INFINITI of Orland Park today.